We will create a bathroom to your unique specifications and walk you through every stage of your remodel, including design and construction. Bathroom Remodeling is one of the best home improvements you can make. A professionally remodeled bathroom can offer the best return out of many other home improvement projects. If you’ve been doing your research you probably already know that many home improvement experts would also agree, that bathroom renovations offer the homeowner the best bang for their buck. Maybe you want to give an old boring bathroom a face-lift with a new tile floor, or back splash behind your sink. Maybe you’d like to add a luxurious tile shower with a custom glass enclosure or even add a bathroom where there never was one before! 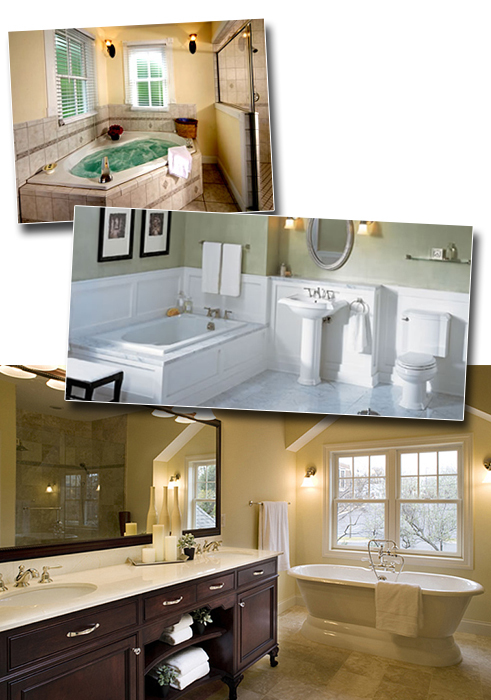 Bell Construction can complete any size or scale of bathroom remodeling project. With so many materials and finishing choices for your bathroom, it helps to have a little professional advice and guidance so you can make good educated decisions based on current bathroom remodeling trends and what will compliment your house the most. We’ve been renovating bathrooms in N.E. Ohio for many years, so we’ve pretty much seen it all when it comes to bathrooms and making them better. We have many unique bathroom remodeling ideas for every size space and client budget. Bell Construction will assist you in designing, planning and building a functional and beautiful bathroom that could rival most 5 star hotels (if you really want it to!) Whether you want to create a spa like setting in your master bath or maybe it’s adding a skylight, a new vanity, double sinks or that giant soaker tub you’ve always wanted. Bell Construction will help you get the bathroom you’d love to have. Bell Construction and remodeling, services all of N.E. Ohio including all of Canton and Akron. Call Bell today to speak with a professional that can help you with all the decisions involved with a compete bathroom remodeling project.